I didn’t know what this book was about when we started to read it. All I knew is that I’ve been trying to convince my son to read one of Kenneth Oppel‘s books with me for several years now, and he finally agreed to this one, his latest. Maybe because of the cool cover with the wasps? Or maybe because I didn’t give him much choice (I was excited to find it still available at the library). It was creepy. Good creepy. But also sad creepy. The boy in the story has a new brother and there’s something wrong with him. His parents are always worried, and life isn’t the same as it used to be. But, in addition to that, Steven is dreaming about wasps and the Queen wasp is talking to him. She says she’s going to help him make his baby brother well, but she will need his help. Should he agree? Is this real, or is he dreaming? If it’s just a dream, then what’s the harm in agreeing? There’s also a ‘knife man’ who comes around to sharpen knives, and knocks on the door incessantly when Steven is home alone. And ‘Mr. Nobody’, who calls his sister on her toy phone. The worst part is Steven doesn’t feel like he can tell his parents and get it all off his chest, because they will definitely just send him back to Dr. Brown, or worse. So, he has to handle this all himself. Sometimes we really aren’t supposed to be the way we are. It’s not good for us. And people don’t like it. You’ve got to change. You’ve got to try harder and do deep breathing and maybe one day take pills and learn tricks so you can pretend to be more like other people. Normal people. But maybe Vanessa was right, and all those other people were broken too in their own ways. Maybe we all spent too much time pretending we weren’t. Through his horrifying experience with the wasps, Steven comes to realize that it’s okay to be different. Nobody is perfect. And, what is normal anyway? He comes to accept and love his new baby brother (and himself) just the way he is. But I knew, absolutely I knew, that this perfect baby didn’t care about our little Theo. It didn’t care about me or anyone else. It couldn’t, because it was so perfect that it wouldn’t even understand what it was like not to be perfect. It could never know weakness or fear. My son liked this book so much, our next one is going to be Boundless. I can’t wait! Aw I love that The Boundless is your next pick! I forgot how creepy The Nest is until I read your blog post… It’ll be interesting to see if your son has different thoughts about wasps now! The Boundless sounds like so much fun – I hope we love it! 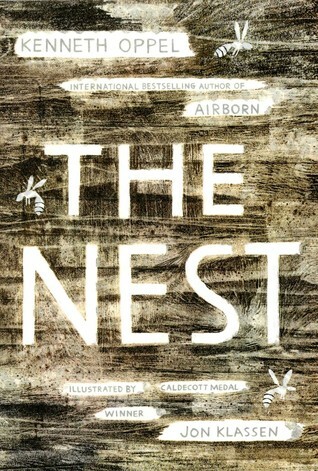 I haven’t read The Nest yet, but I love everything Oppel writes. And Boundless is FABULOUS. Have you read Half Brother yet? So good. Your son might like it – about a young chimp raised in a human family, as a psychology experiment. My older daughter read Half-Brother for school this year (very cool), but my son and I haven’t read that one yet. It’s good to have your ‘thumbs up’ for ALL of his books. So many more to look forward to! Loved The Nest. Kenneth Oppel’s series 1. Airborn 2. Skybreaker 3. Starclimber is a series that keeps getting better with each new book. I read all three of these books out loud to my sons and we all loved them. How to Disappear Completely and Never Be Found is a book by Doug Richmond, Is a page turner mystery especially at the end. We had to stay up late to finish it. Part of it is graphic which is appealing to youth. We have Airborn, but haven’t read it yet. I’ll be on the look-out for the other 2 in the series! I hadn’t heard of How To Disappear before you mentioned it. Thanks for the recommendations! This does sound creepy! I’ve not read Kenneth Oppel before but we have lots of his stuff at the library. I should give him a try when looking for things to recommend for my patrons. Also filing away this title for when my son is a bit older! Haha! It’s funny the things that get to us! A lot of moths flapping around my face would not be pleasant, it’s true. I couldn’t have read this book as a kid. I am terrified of wasps to this day. That’s because wasps are the devil and they want us all dead. This book sounds creepy in a way that would scare me as an adult: the knocking on the door, the calls on the play phone. I could easily see it being a horror movie. Was this a children’s book? It sounds pretty scary! It is a children’s book – middle grade, I believe. But I think you’d have to know your kid. I don’t think he was any more scared than I was. But, if you were someone with fears and anxieties, this might not be the best book to read. To make the wasp part even worse, Steven was allergic. Ooh, okay, now I need to read this and see if it’s creepier than the reigning champion of wasp-related bookish creepiness, Lynne Reid Banks’s The Fairy Rebel. (I suspect I’m not going to find The Nest scarier than The Fairy Rebel, just cause I read the latter when I was young and impressionable, and I’m old and cynical now.) It sounds like you and your boy had a great time reading it! I’m not familiar with this author. What age would you say this is for? The book says this is for middle-grade (my son’s in grade 7). You probably don’t want to go much younger than that. I think most of his books are for middle grade or high school. Maybe good for my nephew then. Yes, could be! You might also want to check out his other books, depending on your nephew’s interests. Such a lovely post, Naomi! I love that you are reading books with your son (definitely a practice I hope to emulate someday when, God willing, I have my own little ones). I hadn’t heard of Oppel so thank you for expanding my reading horizons once again! I love love loved this book too! I love that you speak about reading with your son because it’s one of the things I am looking forward to most for when I have children of my own. I hope they share my love for books so we can read together just like you do with your son. What a fun book to read together! Did you read this outloud to your son or did you each read it and then discuss? I feel like it might be hard to read a creepy book outloud! I read it out loud, which was fun, because I got to see his immediate reactions to the story as it unfolded. The only problem is that it’s hard to stop reading! It sounds pretty creepy. I’m glad your son was able to handle it. I don’t mind bees too much but hornets are another thing. They’re terrible this time of year — so aggressive too. If you step on a nest — god help you. Scary! Sounds like something my son would like! It is so great to read together!! Thanks for reading, Susan! How old is your son? he is 9 and a very strong reader! That is so nice!! We had decided to read the BFG together before the movie comes out but he decided after the first bit that he would rather read independently… glad he loves reading but miss the reading together!